Many caring, animal loving volunteers needed! – Cool San Diego Sights! Many caring, animal loving volunteers needed! These cool guys with the San Diego Humane Society are looking for lots of animal loving volunteers! That might be you! Do you live in San Diego? Do you love dogs, cats and other animals? The San Diego Humane Society needs your help! 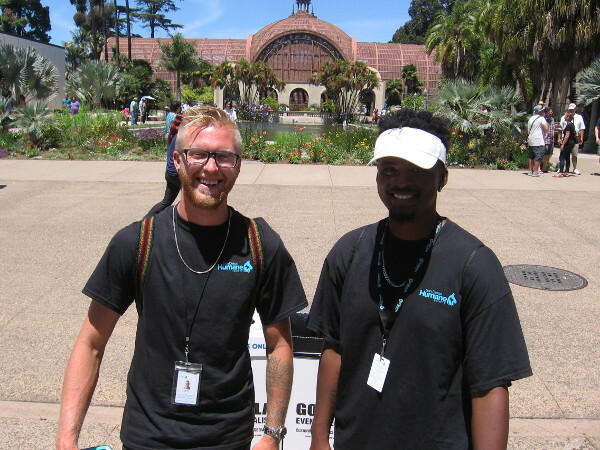 I learned from two friendly guys in Balboa Park that the San Diego Humane Society needs lots and lots of new animal loving volunteers at their San Diego, Oceanside and Escondido campuses. Last week, an agreement with the City of San Diego has the humane society taking over the city’s animal control services. That’s an enormous job! That means literally thousands of more lost pets and “unwanted” critters to care for! There are many volunteer opportunities. You can foster. You can walk dogs. You can love kittens. Yes, even cleaner-uppers are needed. The humane society already has over 5000 volunteers, but that’s not enough! They really need your help! For more information, check out the San Diego Humane Society website here! Previous Previous post: Another sunny day in beautiful San Diego! Next Next post: Fun street art along Fenton Parkway!